No, not reading... reading, like using the eyes to process symbols of a language which are then turned into meaning in our brain. Still sounds like Go. Hmmm. Must be because its Monday. In any case, I just found this offering on The Go Consultants from the GoGoD guys. It looks like a good read. GAH! I need to stop using that word; I'm confusing myself! Over the past month, I have been reading Kagemaya's Fundamentals of Go, Breakthrough to Shodan, and my new copy of Graded Go Problems for Beginners, Vol. 4. What is interesting (and frustrating) is that as I attempt to make sense of the material, and to integrate it into my play, my ability is suffering greatly. Recently I felt I had a breakthrough, and was winning game after game. But now I find that my play has deteriorated. I lose capturing races, misplay fuseki and joseki, and generally muck up. I played my first game of Rengo last night, and I absolutely ruined my team's play. I feel like my sense of direction has been completely upset. So I'm playing a lot of free games until the world stops spinning. Tonight I actually managed to go to the local go club meeting down at ASU. It was great to be able to actually play a couple of games with the stones in hand instead of on the computer. There's a different feeling about it. More personable, I suppose. In any case, I was pleasantly surprised. Although you wouldn't know it by my steady KGS rating of 11kyu, apparently all the reading and playing I have been doing has been helping. I played two games, and won them both. In the first game, I played a 5kyu at four stones, and won. It was a bloody game with groups dying off left and right. We used practically every stone he had in his set, and at the end black had won. I built a beautiful moyo and he had no choice but to invade. And I killed the invasion. Quite proud am I. 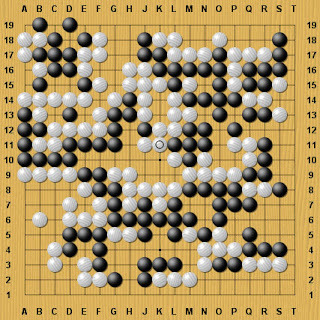 The second game was against an 8kyu with two stones, and we played very quickly. The game was over in less than half an hour. White resigned - again, due to a huge unassailable moyo. Something about Wilcox's Sector Fights must be clicking. Of course, as soon as I play my next two games, I'll be brought down to earth. But for now, I'm happy! One of the very first purchases I ever made in terms of Go learning materials was Bruce Wilcox's Sector Lines and Contact Fights. I remember going through these two products and thinking it was all so easy. So why couldn't I seem to integrate the material. Well, I hadn't looked at them since I hit 15kyu over a year ago, and I pulled out sector lines last night and began to reread through it. I went through just the Elementary material, and it was amazing. There were concepts in there that I had completely failed to see or to understand the first time through. And this was just the elementary material. There are still the novice, adept, and advanced sections, or whatever the heck he calls them. There was a recent thread on godiscussions to which I was pointed by chiyodad in a roundabout way. And though I did not chime in there, it was what motivated me to revisit this material. And I find that his style of teaching through his dojo software is very clear and understandable. I've been losing a lot otherwise, but I hear that's the key to greatness. It's been a long series of losses. In the past, this is the type of activity that would have caused me to keep playing just one more game, shooting for that win that I knew lay just over the horizon (but which invariably - in fact - didn't). However, thanks to NannyOgg's last post, and her repeated tutelage, I have been able to simply continue to play, seeking only the best (bad) move I can make, without care of winning or losing. And in a very calm game last night, I beat a 7K by 40+ points. He was greedy and went for just that little extra bit too much that overextends one. I did the same thing in my last 12 games. And lost. Okay, this may not exactly be your speed, but I found these Go Lessons 1, 2, and 3 to be amusing. Seriously. That is the strongest shape around.